Follow along here as we post our thoughts, impressions, and commentary of the live WWDC keynote. Posting as events happen. 2:50PM EST – The End. No One More Thing. See you all Friday on the Podcast!!!! 2:48PM EST – 3G iPhone Commericals being played. 2:42PM EST – 3G iPhone in 70 countries in a few months. 2:41PM EST – 3G iPhone is in a small world. Corny in audio format only. 2:39PM EST – 3G iPhone so far is not news, everything we have speculated on for months. 2:33PM EST – Steve Jobs showing how much faster browsing on 3G is. Gee, thanks, glad I paid $600 for MY iPhone. 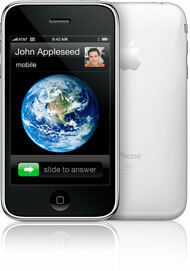 2:31PM EST – Steve Jobs – Introducing iPhone 3G. Slimmer, new headphone jack, better audio, slight redesign. 2:30PM EST – Steve Jobs – 6 Million iPhone sold. 2:29PM EST – Steve Jobs is back on stage, talking iPhone. 2:28PM EST – From Mazen – I’d like to see a MobileMe air application. That’s the perfect partnership for Adobe and Apple. MobileMe needs more space. I’d use it if it could become my one stop online storage space for backups and documents I might need on the go. 2:27PM EST – Mobile Me $99/year. Free 60 day trial. .Mac is being replaced. Already a .Mac member? Automatically upgraded to Mobile Me. 2:27PM EST – Mobile Me demo is over. What will Steve have for us next?!? 2:23PM EST – Mobile Me still being demo’s. Sounds interesting. 2:18PM EST – Mobile Me being demoed by Phil. Keeps saying “Web 2.0” over and over. Okay, Phil, we get it! 2:17PM EST – Mobile Me works over the air. Pictures, address book, iCal, Mail, etc. 2:15PM EST – From Mazen -With how poorly the new google calendar sync works Mobile Me makes me nervous. 2:09PM EST– iTouch will cost $9.99 to upgrade. App store will be in 62 countries. 2:07PM EST– Full iWork support in iPhone. 2:05PM EST– Steve Jobs back on stage. Contact Search is real. Be able to see Office Docs! Alt, Delete, Move. Scientic calculator. Parental Controls. Many language support. 2:00PM EST– Developer demo is over. Background applications will not be allowed. Making fun of Vista right now. Prettty funny! The iPhone will use a Push Messaging API instead. 1:57PM EST– A company from Spain (Developer Legends), which will be the last application developer, is up. It is a game. 1:55PM EST– (from David Cohen) Apple has been presenting all types of iPhone app for the last half an hour. Everything from games to medical apps. I wonder how stable the iPhone is when running a lot of these apps? 1:50PM EST– A medical application is up. Does it offer free insurance? THAT I could get behind! 1:49PM EST– Another software dev. on stage. Let’s get to hardware already! 1:48PM EST– Software was called “Band” Sounded neat. 1:42PM EST– More game coverage from Pangea. 1:40PM EST– “The iPhone always knows where you are” Good or bad? 1:38PM EST– TypePad application will be free. Next up is Associated Press. A news reader coming? 1:36PM EST– TypePad, duh. Audio quality is not the best, but I can hear pretty well. David Cohen tried an audio chat, but I could not hear him well, what with Ustream running as well. 1:35PM EST– Some company called “Loopt” which is a social network and will be free. Next up, TypePen I think it is called. 1:33PM EST– ebay application will be free! They are happy to develop for iPhone. 1:31PM EST– Scott asks “How big will Mokey Ball be? If it’s 2 GB, it won’t fit on my 8GB iPhone.” Also, Claus has joined the chat. 1:30PM EST– Sega’s Super Mokey Ball will be $9.99. Ebay is coming on stage next. 1:26PM EST– Sega showing off Monkey ball. Has all major charecters from the consol game. 1:26PM EST– Sega on stage. iPhone game time! 1:25PM EST– Demo of building iPhone app done. Big applause. 1:23PM EST– Still demoing building a simple iPhone application. 1:21PM EST– Gizmodo has best pictures says Scott. 1:15PM EST– iPhone tools demo for developers showing now. Talking interface building and XCode. Yawn. Scott says ustream is working decent now. 1:14PM EST– Snow Leopard is real! 1:13PM EST– TWIT live has a video feed. Sounds like crap and crappy video. Talking about Enterprise software. 1:00PM EST – Mazen is in iChat! Should be starting any second, I hope!